^ Rear-Admiral G.S. Ritchie CB, DSC, FRICS. THE DEEPEST DEPTHS, from No Day Too Long - An Hydrographer's Tale. [2009-03-10]. （原始内容存档于2008-03-19）. ^ New Chief Hydrographer of Japan. [2007-07-04]. （原始内容存档于2007-11-06）. ^ Japan Atlas: Japan Marine Science and Technology Center. [2009-03-10]. 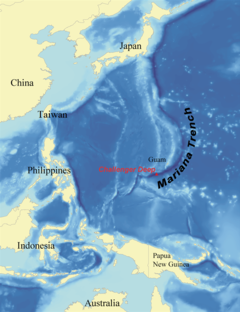 ^ James Cameron Completes Record-Breaking Mariana Trench Dive. [2012-03-25].